So if the garbage is not tossed into the sea, what happens to it? 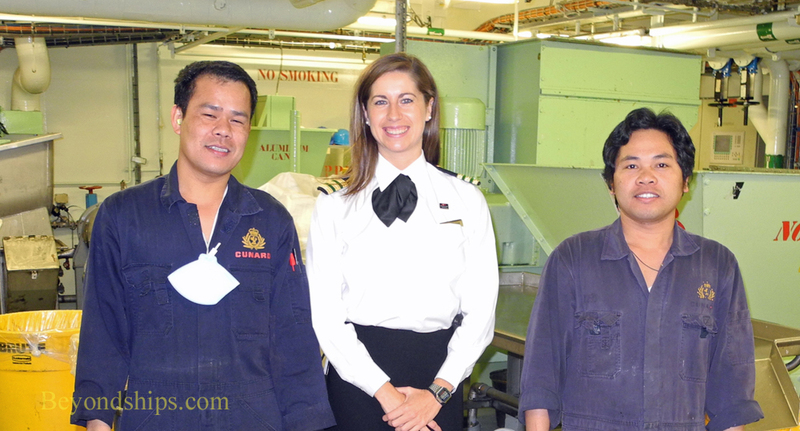 Cunard follows the “3R's rule” which seeks to promote “reduce, reuse and recycle” waste. 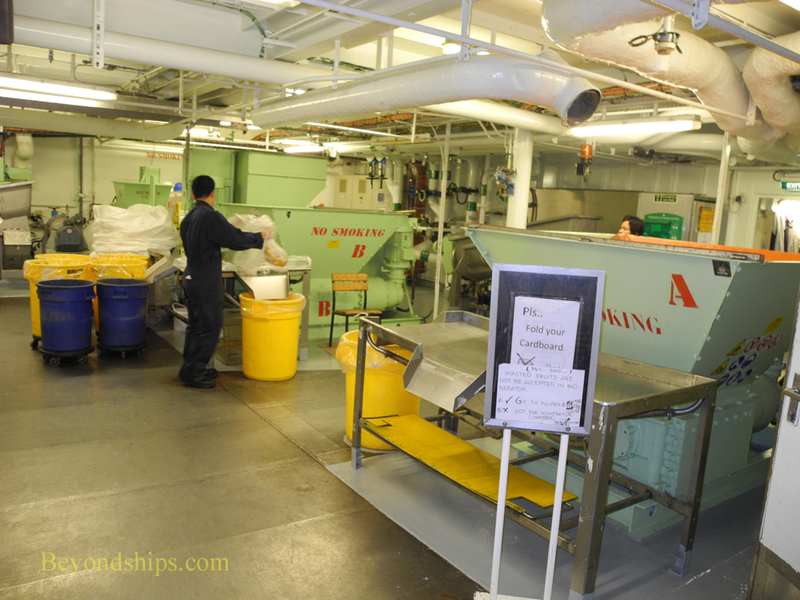 Accordingly, garbage is collected from the staterooms, public areas, and crew areas and is brought to QM2's waste handling room. About 11,000 cubic meters of waste is processed each year weighing about 2,000 tons. The waste handling room operates 24 hours day and is manned by six people (three per shift). The largest category of recyclables is glass. After all the wine and beer has been consumed, the empty bottles still remain. Approximately 300 tons of wine and beer bottles are crushed, collected in bags and sent ashore for recycling each year. “We try to recycle as much as possible with regard to cardboard and paper. We could burn this easily because it is a combustible material. But our policy is to try and keep it and off-load it ashore for recycling.” QM2 produces 200 tons of cardboard for recycling each year. Similarly, plastic is shredded and compacted. Some types of plastic such as plastic water bottles could be incinerated under the applicable laws. 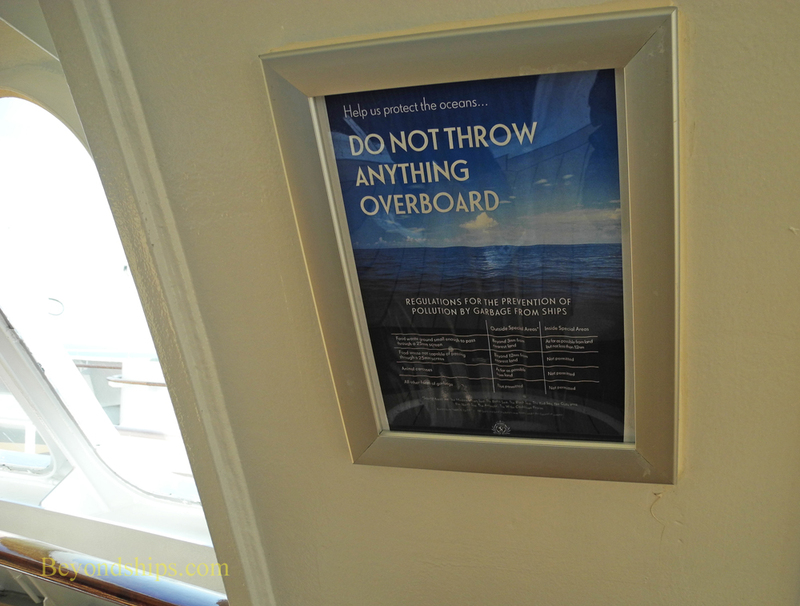 However, under Cunard's pro-recycling policy, they are kept for recycling ashore. 35 tons of compacted plastic waste is recycled each year. 15,000 liters of used cooking oil is sent ashore for recycling into bio-diesel fuel every year. Some 25 tons of aluminum cans and 80 tons of steel cans are recycled. Right: A bag of broken glass awaits recycling ashore. Burning reduces the volume of this waste by 80 percent. Approximately 150 tons of ash are produced each year. Queen Mary 2 is known for its dining. Of course, as in any kitchen, preparing and cooking meals yields some waste. Similarly, the passengers and crew do not eat everything that is on their plates. Thus, the ship needs to dispose of a substantial quantity of food waste. Left to right: Waste Disposal Engineer Ronald Pedrano; Environmental Compliance Officer Ariadna Mayoral; Waste Disposal Engineer Leonardo Palarao. 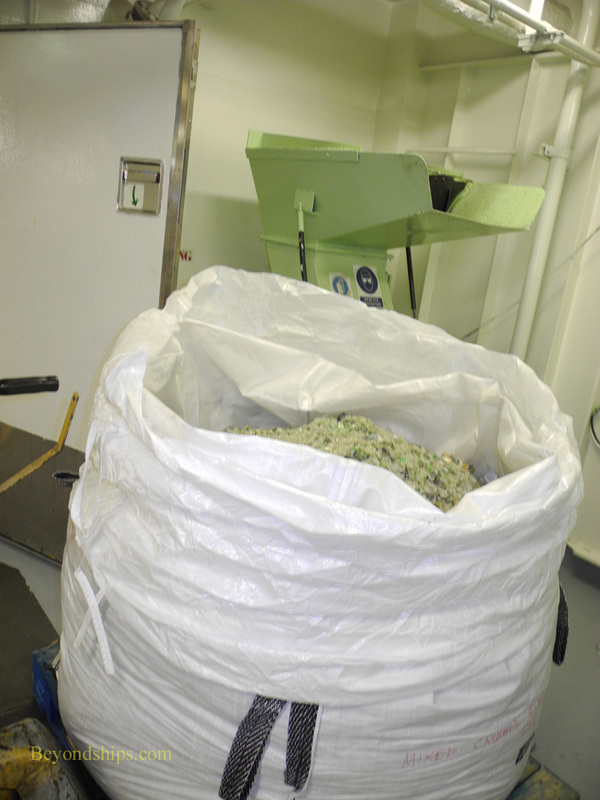 Some food waste, such as large bones and pineapple tops, that cannot be turned into a puree is incinerated onboard or off-loaded ashore. Because foreign species could harm native crops and otherwise disrupt the local ecosystem, countries such as the United States require special handling of garbage that may have come into contact with food, e.g., trays used in the galleys. Such garbage is set aside for inspection by local authorities. After passing inspection, it is off-loaded into special government containers for disposal ashore. Left: The Waste Handling Room. Humans, of course, create waste products. In order to handle this waste, QM2 has its own waste water treatment plant. The bio-mass that is separated from the water during the treatment process is incinerated. The transportation of people and things produces waste products. Consequently, just as the cars and trucks that move people and things around a city are subject to environmental regulation, there are rules governing the propulsion of a ship. “Hazardous waste is the most restrictive solid category that we have onboard. [In general], we cannot burn it, we have to land it ashore.” Consequently, most hazardous waste is temporarily stored on the ship and then off-loaded ashore to the authorized vendors. Such waste is stored apart from the other waste in a separate area, which is always locked. It is continually monitored by the waste disposal supervisor and the environmental officer. Some types of hazardous waste can be incinerated on the ship. An example is “red bags” - - bags from “the different staterooms and the medical department [containing garbage] that has potentially been in contact with any virus or bacteria.” Burning these bags reduces the potential for the virus spreading. Other examples of hazardous waste that can be incinerated are expired medicine and such things as oily or paint rags. All through the process of handling hazardous wastes, there is a stream of paperwork in order to ensure compliance with procedures and applicable law. In sum, environmental considerations enter into essentially every aspect of Queen Mary 2's operation from discharging ballast water to the cleaning the decks. Even such things as the onboard photography is covered inasmuch as processing the photos involves the use of chemicals and silver. “We really take part in all the decisions that are made.” The goal is to maintain Queen Mary 2 as an environmentally friendly ship.